Do-It-Yourself (DIY) Audio Projects - projects for audiophiles, hi-fi enthusiasts, music lovers, electronic hobbyists, woodworkers and those who like to learn, build and listen to music. This site exists to promote the hobby of DIY Audio. There is nothing for sale here. All project documentation presented on this site is free for personal non-commercial use. If you have a DIY Audio Project that you would like to share with others through this site, or if you have any comments, contact us or post a message on the DIY Audio Projects Forum. Questions about a specific projects can be sent to the project author noted at the top of the project page. If you are new to DIY Audio but want to learn more, take a look at our DIY Audio Book recommendations. These are some of our featured DIY audio projects. For more DIY projects, use the navigation menu on the left hand side of the page. This inexpensive Single-Ended Triode (SET) amp is built around a pair of 6CY7 vertical deflection dual triodes built for TVs. At full output the amp produces a clean 1.3 Watts output per channel into 8Ω. The Edcor XSE output transformers are rated from 70Hz to 18kHz. This amplifier did a little better than this having a -3dB bandwidth from about 46Hz to about 30kHz. The 6CY7 stereo amp uses a 6CA4 tube rectified power supply with excellent channel separation. Matt reports: This is quickly becoming my favorite amp. I currently have a set of NOS Sylvania tubes in it, but I have also used a set of old used GE tubes which sound just as good. I highly recommend that anyone looking for a little iPod or computer amp give this one a try. This is the Boozhound Laboratories JFET Moving-Coil (MC) Pre-Preamp Kit. The MC pre-preamp kit consists of a PCB, standoffs, the circuit parts and building instructions. The builder will need to provide a 12-24VDC power supply, an enclosure and miscellaneous hardware like connectors and switches. The kit uses 2SK170 JFET transistors and comes with fabulous vintage Russian military paper-in-oil (PIO) capacitors. Mark uses 9V batteries for the power supply and is very pleased with the results. Matt describes the design and construction of a Single-Ended Triode (SET) amplifier built around a pair of 6EM7 double triode tubes. The clean output power from the 6EM7 SET amplifier is about 2.2 Watts per channel with a frequency response that matches the audio output transformers. The single-ended 6EM7 amplifier is housed in a vertical wooden chassis that has been styled after early vacuum tube equipment of the 1920s. The 6EM7 SET amplifier uses a 6CA4 tube rectified power supply with excellent channel separation and which is very quiet. Matt reports that the 6EM7 amplifier sounds wonderful! The bass is well articulated without being boomy, mid-tones are clear and even, and the highs are crystal clear. Once again Mark tries on the Fostex FE206En high sensitivity fullrange driver, but this time the end result is a large elaborate back-loaded horn loudspeaker. The speaker cabinet plans are from the FE206En driver datasheet. The horn loudspeaker cabinets are made from 21 mm thick pine plywood and use a single FE206En fullrange driver and no crossover. Australian beeswax is used on the outside of the horn cabinet and heavy cedar oil was applied to the mouth of the horn. The sensitivity of the FE206En driver is greater than 96 dB / 1W / 1m, so the rear-loaded horn speakers are very well suited for use with very low power tube amplifiers. Mark reports that the horn speakers can draw an extremely accurate soundstage, sound excellent and have lead to a whole new listening experience with Paris, a 2.5W 6EM7 SET amplifier. The Gobo Stereo Amplifier kit is a class-AB chip amp kit based around the LM1875 IC. This is a complete amp kit that includes all the necessary parts and enclosure to build a stereo amplifier. The LM1875 amp kit comes with audio-grade capacitors and toroidal transformer. The Gobo amplifier kit is easy to build, looks and sounds great. The amplifier kit is well suited to first time amp builders. This DIY 300B triode amplifier project was completed by Stamou Tasos who is from Greece. As a thank you for the 300B amplifier schematics, Stamou has shared his implementation of the 300B single-ended tube amplifier schematic by J.C. Morrison. The 300B SET amp uses a 6SN7 direct coupled driver stage and an all low mu triode array. The power supply filtering sections have been duplicated for each channel for this 300B triode amplifier and premium parts are used throughout. The audio output transformers are Lundahl LL1623. This is a great sounding 300B triode amplifier that I am sure DIYers will find very rewarding. The 4S Universal preamp is a Super Simple Single Stage (4S) line level Hi-Fi preamplifier that works well with the entire range of 12A*7 tubes - 12AU7, 12AV7, 12AY7, 12AT7, 12AZ7, and 12AX7. You can change the tube type to vary the sound and gain considerably. The preamp uses a 6CA4 tube rectified power supply which is very quiet. The Universal preamp is fun as it allows tube rolling to compare various tubes in your stash. This is a great simple preamplifier unit to bring out the most in your power amps. Gio has put together a small bookshelf / monitor speaker using a single inexpensive fullrange speaker driver. The enclosure is a 6.9 L bass reflex cabinet tuned to about 95 Hz that follows the speaker box plans included with the driver datasheet. The loudspeakers use a single Fostex FE103En fullrange driver with no crossover circuit. The speakers work well as nearfield monitors and combined with a subwoofer the speakers can be used for home theater duties. This low power tube headphone amplifier project comes from Bruce Heran. The simple tube headamp uses one 6DJ8 (ECC88) tube per channel. The amplifier circuit is push-pull and biased into class-A operation with a CCS. Gain is sufficient that no driver stage is required for the tube amp. The 6DJ8 tube headphone amplifier is suitable for use with many Hi-Fi headphones. Output power is over 100 mW between 32 ohms to 300 ohms. The response is 20 Hz to 28 kHz within 0.5 dB and the wide band signal-to-noise is -84 dB. Check out the Parts-Express.com Speaker Projects Gallery for a wide range of DIY Loudspeaker projects. The Speaker Projects Gallery features over 50 DIY speaker projects that have been built by other DIY audio enthusiasts. Each speaker project includes complete drawings to illustrate construction of the speaker enclosure, crossover schematics, a full parts list and photographs of the finished speaker project. Shown in the photo to the left is the TriTrix MTM TL DIY speaker project. For those who are not great with woodworking, the TriTrix is available as complete kit. Bruce Heran of OddWatt Audio outlines the design and construction of monoblock Push-Pull EL84 (6BQ5) valve amplifiers. The Mini Block tube amps use a 5751 twin triode to drive the EL84 push-pull output stage which is biased into class-A operation, ultra-linear mode. Output power is 5.8 W @ 2% (0.25% @ 1 W) and the response is 10 Hz to 44 kHz within 0.2 dB. Bruce reports that the Mini Blocks are more powerful than the Poddwatts and seem to have more detail while retaining all the good characteristics of the Poddwatt amps. 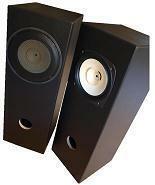 Mark has put together his second set of the Fostex FE206En double bass-reflex speakers. 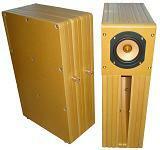 The speaker box plans are from the datasheet that was supplied with the drivers. The loudspeakers use a single Fostex FE206En fullrange driver and no crossover. The sensitivity of the drivers is about 96 dB / 1W / 1m, so the double bass-reflex speakers are well suited for use with flea and low power tube amps. The two chamber box design extracts good bottom end from these low displacement drivers. The speakers will be used in a home theater so for a non-reflective finish the speaker enclosures are painted with a undercoating paint for a stipple like finish and flat black paint. Mark reports that the speakers are an excellent mate for use with his 2.5W 6EM7 SET amp. In this DIY attenuator project Matt uses an inexpensive ladder type stepped attenuator to make a passive stereo volume control. The switched attenuator comes fully assembled and uses 1% precision metal film resistors on a make before break 2-pole (stereo) 24-position switch. Checking noise, Matt found that the stepped attenuator has a noise figure which is about 26dB lower than a PEC hot molded carbon potentiometer of the same value. This attenuator project is simple to build and should save you some money if you are in the market for a passive hi-fi volume control. Nandor a very talented DIYer from Hungary has built this fabulous looking Hi-Fi record player. The DIY turntable project uses the platter and the direct drive motor assembly and controls from a Dual 701 record player. The tonearm is built from scratch following a magnetically Stabilized design which means that there are no fixed pivot points or bearings. The turntable plinth is made using stacked layers of plywood. A DIY record weight rounds out this challenging DIY record player project. Tom has put together an instructional guide to construct simple line-level RCA interconnect cables. The cables use shielded instrument wire and is very simple to construct requiring only some basic soldering skills. The required parts are easy to source and a pair of these shielded RCA cables can be built for as little as $10. Use these simple DIY cables to upgrade your stock and inexpensive interconnects. Rogers has built an improved version of his popular and simple low voltage 12AU7 / IRF612 Headphone Amplifier (5 Aug 2008). The new version allows novice builders to experience assembling and listening to their own headamp. The headphone amplifier is similar to the previous version in that a single 12AU7 (ECC82) vacuum tube is used for voltage gain and an IRF510 MOSFET follower stage is used to provide current to drive demanding headphones. The hybrid tube and MOSFET amplifier operates off a 12V SLA battery so there are no high voltage concerns. The main difference from the original version is that a LM317 regulator is used as a CCS to bias the MOSFET into class-A operation instead of a load resistor. The project includes PCB image files and can also be built on a protoboard. This simple headphone amp can be built for about $40-50. The D4-1 DIY Back Horn Speaker Kit put together by Tang Band is very simple to build, sleek looking and sounds great. The DIY speaker kit comes complete with all the parts and tools required (except for a soldering iron) to build a great looking, little rear loaded single driver horn speaker system. There is no cutting or finishing (painting / staining) required to complete the speaker kit. The small horn speaker kit goes together much like ready-to-assemble furniture. The end result is an attractive and compact horn speaker that sounds great and is fun to build. This fantastic looking tube amplifier was put together by Mr. Chey in Thailand. The DIY enclosure is constructed from aluminum sections and the audio output transformer covers are built using copper clad board. The circuit is very simple, a single-ended output stage using 6L6 or 5881 tubes, driven by 6SJ7 or 6SD7 cutoff pentodes. Mr. Chey is very pleased with the results and has replaced his solid state amp with this beauty. Nice work! A build and review of the Odd Block KT88 Series 1 Tube Amp Kits. The monoblock tube amp kit uses an SRPP input stage with 5751 driver tubes and a push-pull output stage with KT88 power tubes. A constant current source (LM317HVT voltage regulator) is used to force the output stage into class-A operation. A solid state power supply is used. The tube amp kit comes with a nice steel enclosure and the power output is about 25 watts. The amplifier circuit is very simple with minimal parts in the signal path. The result is a very nice sounding tube amplifier kit that performs well. Adam has put together another fine looking set of Do-It-Yourself (DIY) Speaker Cables for his DIY 3-Way Hi-Vi Tower Loudspeakers. The cables are very simple to construct and are comprised of 16 gauge wires that are twisted together in alternating directions. The cable geometry results in a very low-inductance speaker cable with an equivalent wire gauge 10 so insertion losses are also low. High quality gold plated banana plugs, TechFlex and a laser etched decorative Oak Sleeve round off a very nice looking cable that rivals the performance of high quality commercial cable offerings. Bruce's second follow up to his original "OddWatt" project are the "Odd Blocks", a pair of KT88 Push-Pull Mono Block Tube Amplifiers. Like the Oddwatt 225, the mono blocks are scalable and can be used with a number of octal tubes (KT77, 6CA7, EL34, 6L6GC, KT88, 6550, KT90). Like the previous projects the driver stage is an SRPP but this time with the 12SL7 tube. The output stage is a Class-A UL SIPP using KT88 tubes. LM317HV Regulators are used for the cathode CCS.